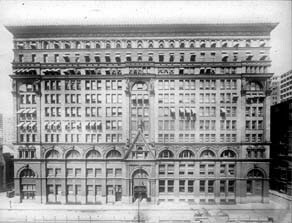 Erected in 1896 near Broad Street, the Witherspoon Building cost a staggering one million dollars to build and was once the tallest structure in Philadelphia. My initial reaction was surprise. I knew about the six Witherspoon statues of prominent American Presbyterians currently outside the Historical Society’s headquarters. But statues of biblical prophets? I hadn’t heard about those. My interest grew as the visitor explained that he and other researchers didn’t know what happened to the prophet statues. When I found time, I began digging in the archives. Decorated in the American Renaissance style, the Witherspoon Building was built for various departments of the Presbyterian Church in the U.S.A., including the Presbyterian Historical Society and General Assembly offices. The building’s ornate stone work was symbolic as well as aesthetic. The statues of the six towering figures of American Presbyterianism (Francis Makemie, John Witherspoon, John McMillan, Samuel Davies, James Caldwell, and Marcus Whitman) stood above the Walnut and Juniper Street entrances to the building. Above them on the eighth floor were ten statues of biblical prophets. The prophet statues were placed there to symbolize their role as intermediaries between heaven and earth. As imposing as the Presbyterian statues are, the prophets stood a foot and a half taller at ten feet six inches. Starting on Walnut Street and continuing to Juniper and Sansom Streets, the prophet statues depicted Moses, Samuel, Elijah, Elisha, Jeremiah, Ezekiel, Daniel and John the Baptist. Interestingly, the two most prominent corners of the building were reserved for two prophetess statues: Deborah and Huldah. Samuel Murray, in collaboration with Philadelphia painter Thomas Eakins, sculpted the prophets. He based the statues on descriptions provided by William Henry Green, a theologian and Hebrew scholar at Princeton Theological Seminary. 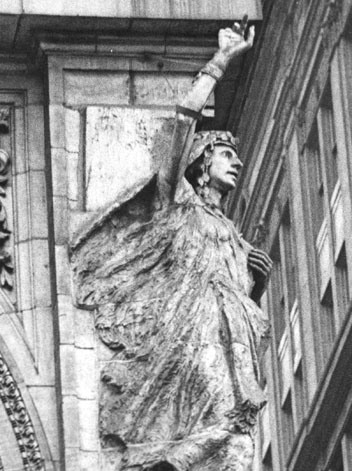 When the Historical Society moved from the Witherspoon Building in 1967 to its current location on Lombard Street, it took the six Presbyterian statues by Alexander Stirling Calder. Today, they are safely preserved in front of the Society. The prophet statues were not so lucky. According to a 1969 memo from the Board of Christian Education, the Philadelphia Memorial Park Cemetery in Frazer, Pennsylvania, bought eight of the prophet statues for an undisclosed amount. The Moses and Elijah statues were sold to Arthur Garrett, President of Community Utilities, Inc. in Skagway, Alaska. A recent call to the Memorial Cemetery confirmed that the Prophet statues were once there, but were sold in the 1970s. No one at the cemetery’s office could say to whom. According to an article that appeared in a 1979 issue of Arts Magazine, only three of the prophet statues survived: Moses, Elijah and Samuel. What remains of these amazing statues exists only in photographs such as those currently preserved at the Presbyterian Historical Society.